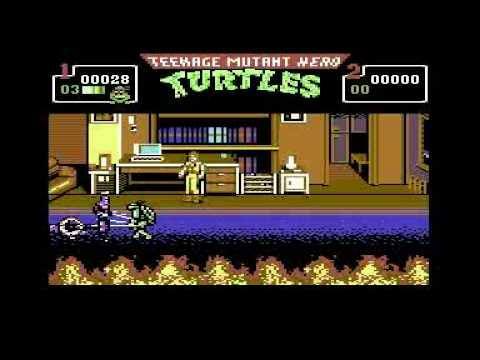 The first C64 Turtles game was rushed out by Imageworks in time for christmas. It wasn’t great. The arcade convo that followed in the Spring was much better, with some real pace. It’s one of Scott’s favourite CF memories. Soon after getting my C64, I was in my local newsagent. On the shelf I saw a painting of theTeenage Mutant Hero Turtles. I was a massive fan at the time and as I looked closer, I realised that it was a magazine for my new computer. I pestered my Mum and she bought what turned out to be Commodore Format 14 (November 1991) for me. I was a late starter to the C64. I’d never read computer magazines before. I had no interest. But CF was about to change that forever. When I got home and I started to read, I realised that the ‘free’ covertape had a demo of the new Turtles game on it. I thought that ‘demo’ meant that it could only be watched! So I loaded it up, stared at it and my turtle just stood there. When I used the joystick, he moved. I was amazed! For a mere £2, I had got a ‘mini’ turtle game. I played it to death…and then started on the other games. In the beginning, I wasn’t interested if it wasn’t Turtles! But I loaded Aliens and got lost in no time, followed by Tilt which was an addictive little puzzler, but then I spent hours playing Terror Of The Deep. Did anyone ever find the Loch Ness Monster? I just swam around in circles. Finally, I started reading the magazine (wait. This games tape had a mag taped to the back of it? – Ed). I saw cheats, maps, techy stuff, and The Mighty Brain’s letters page. I was hooked straight away. Memories? I do remember that the Early Warning! preview scanner never appeared to make much sense. As time went by, games would float back and forth and some would just vanish! I also remember noticing that they did a review of a game I liked called Slightly Magic. CF said it was rubbish and gave it 32%. Boy was I puzzled! I was gripped by The Clyde Guide, too. That feature would spawn into a game I still love –Creatures II. So off the back of all this, I started getting Commodore Format every month. I couldn’t afford many games myself, but their tapes were great. I loved Sphinx Jinx, Cyberdyne Warrior, Head The Ball, Mission Impossabubble and the demos of Creatures II and First Samurai! I was truly hooked. And this went on until issue 41. After that, local stores stopped getting it. The mag just vanished. I used to wander the shops in vain but I never saw it again. After a while, I phoned Future Publishing and asked someone what was happening. I remember being told that the magazine was still around. Eventually I saw it in WH Smiths Birmingham City centre and there it was – a shell of its former self. Paper thin, no reviews and the cassette was in a cardboard box. The end was so disappointing for me. Vanishing and then reappearing in that state was like a pet going missing and coming back all out of shape!